In Rokugan, it is said that honor is stronger than steel. While even the finest blade can bend and break under the heat of the forge, the Emerald Empire's society has been folded in the forges of politics and war for more than a thousand years, and it has not yet broken. The society of Rokugan follows a divinely ordered pattern set down by the eight Kami, who shared their celestial blessings with the mortal realm. Rokugan is a land of strict social stratification, where an improper look at the wrong time can mean death. This is an era of sudden change and upheaval, however. Mortal schemes, natural calamities, and celestial turmoil alike have disrupted the political, military, and spiritual equilibrium of the land. Long-simmering rivalries and fresh betrayals ripple through the courts and on the battlefield. The Chrysanthemum Throne is beset by threats from without and within, and the honor of the seven Great Clans—the families descended from the heroes of legend and sworn to rule their lands in the Emperor's name—shall be put to the test. This is the stage of TheLegend of the Five Rings Beginner Game, a new roleplaying experience in the land of honor and steel. 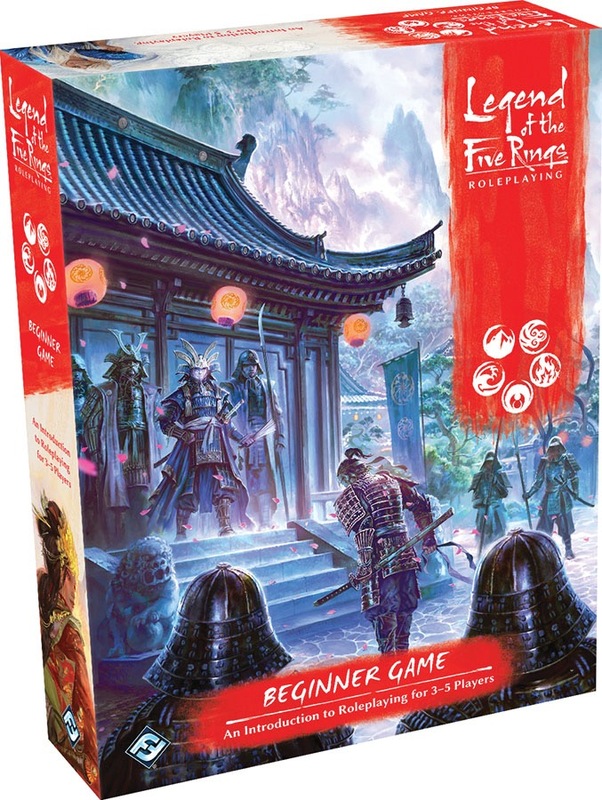 The Legend of the Five Rings Beginner Game allows anyone to take on the role of a Samurai in Rokugan With a full range of four character folios, a fully realized adventure book, a set of custom dice, a map of Rokugan, a variety of tokens and a complete set of rules including a play example, TheLegend of the Five Rings Beginner Game gives newbies and veterans alike the perfect door to the Emerald Empire. Ships from our warehouse in 5 to 23 business days.